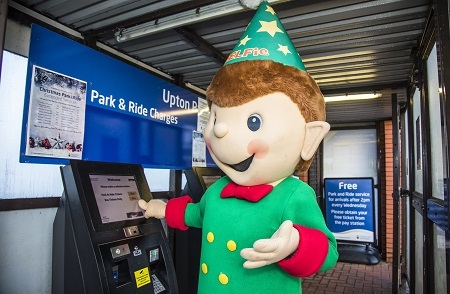 Passengers on the Park and Ride service had some festive cheer today with a visit from the City’s much-loved Christmas elf, ChELFie. 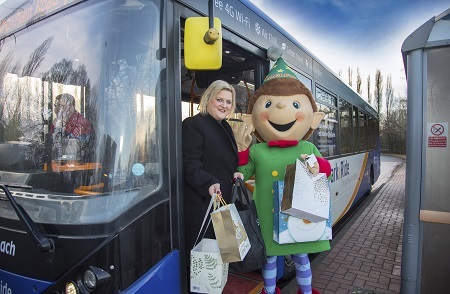 Cheerful ChELFie, the mascot for the CH1ChesterBID, was on hand this morning to help Councillor Karen Shore, Cabinet Member for Environment, carry her last minute Christmas shopping onto the bus. Councillor Shore said: “Chester is truly magical at this time of year and we hope this Christmas again offers something very special for both residents and visitors. The Park and Ride service is an ideal way to travel into the city and avoid the parking queues and travel all day for only £2.00. Our buses use the latest enviro-clear engine technology, so making the switch to the bus makes a positive difference to the environment. Park and Ride services have been extended to 9pm in the run up Christmas, to coincide with late night shopping in Chester.